More information, email Bob Frassinetti. Book on Shipwrecks down South Atlantic,Argentina. 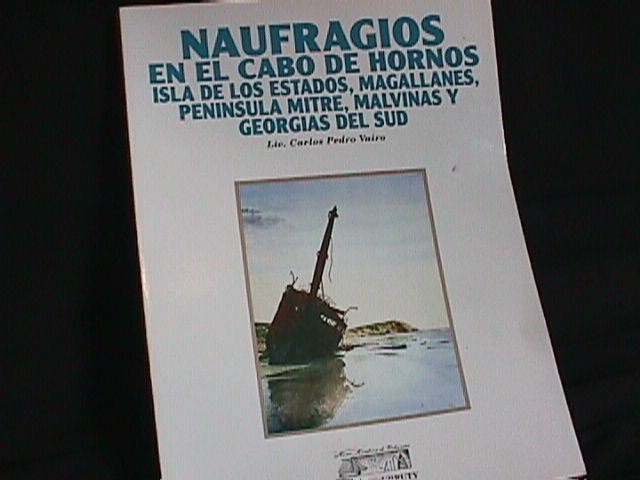 Spanish title,Naufragios en el cabo de hornos, isla de los Estados, Magallanes, Peninsula Mitre, Malvinas y Georgias del Sud by Lic. Carlos Pedro Vairo. Shipwrecks a the Cape Horn, Estate island, Magellan, Mitre Peninsula, Falkland islands and southern Georgias by Lic. Varlos Pedro Vairo Email: Bob Frassinetti. Art & Antique Dealer & Journalist working from the south of South America. Book on Shipwrecks down South Atlantic,Argentina For more information: Email: admin@frassinetti.com Bob Frassinetti. Press here to go back to web blog:Daily Updates on Art, Antiques, Collectibles as well as travel information for Buenos Aires, Argentina. Phone me thru Skype, ID: Bob Frassinetti or you can also chat with me thru Yahoo, press here: Yahoo Contact Find me on MySpace and be my friend! Argentina's lighthouses are a wonderful trademark to this broad and beautiful land. It shouldn't be an other way for a "discovered" territory. It was one of the first constructions to be done when arriving to main land, in order to guide the upcoming travelers, these were rough and precarious, made out of wood and sometimes just a fire on the coast. As those initial ports began to transform into bigger and more important cities, as technology in terms of illumination evolved, these precarious lighthouses began to be transformed and converted into architectural icons, impressive lighthouses, that enlighten the shores of the "new" continent. Serving as important beacons to all sort of ships sailing the waters off the Atlantic coast. The 19th century was the time in which most of the southern lighthouses were built, expressing through means of their lines and concepts aesthetic trends prevalent in good old Europe, and sometimes new and native trends that blended with some classic solid feature. Most of those lighthouses have remained in use to our days. Outstanding style and technological marks very well appreciated as social and cultural monuments all over the world. The thick glass prisms of the Fresnel lenses invented in 1822 focused from a whale oil or kerosene wick lantern, allowed the lights to penetrate only about 20 miles out to sea, but are still considered a marvel of engineering and art. Tours are arranged on a personal or group basis. However there must be at least two travelers to this lighthouse tour. Tours are custom made to fit your needs and interests. Once you've booked your flight and purchased the tickets we begin to plan your trip. There's no need for all travelers to book the same lodging, for this is a very personal choice. Hence we'll provide you with all the necessary information for you to choose among the many and interesting lodgings, from a home styled Bed and Breakfast, to a BOBO* hip inn or hotel, to a 5 star accommodation, we handle all reservations and bookings. For flight booking we highly recommend a Wednesday arrival to Buenos Aires for you to take the best out of your days in Buenos Aires and the amazing lighthouses we're going to visit. Valeria del Mar is a perfect paradise like town by the sea. Its beautiful pine and eucalyptus woods, a sort of unspoiled getaway, strategically located in between the two biggest lighthouse areas of the northern Atlantic coastline of Argentina. Argentina’s architecture is one of its finest artistic and more evidentially cultural expressions. No wonder its capital city, Buenos Aires, was christened The Paris of South America, for its outstanding aesthetic resemblance in terms of style and quality. Early in the 20th century, when Argentina was celebrating its centennial and rehabbing the country’s major cities welcoming Modern times into their landscape as well as their own culture, Europe was going through a turmoil of political and economical growth and change. Back then London, Paris, Berlin and Rome were the capitals of style, homes to aesthetic masterminds and developers; however there was not much room for upcoming artists creating in the edge of technique and rule. Mario Palanti, Calvo, Jacobs and Gimenez, and Eduardo Le Monnier are just some of the brilliant men who found in Buenos Aires an immense blank canvass in which to portray their unique aesthetic vision with a twist. Mario Palanti was the man behind one of Mayo Av finest constructions: The Barolo Palace. The palace, it is said to be an homage Dante´s Latin geniality, a synthesis of the basic conceptions within the Divine Comedy. Displayed following the directions of the Southern Cross, the building rises from the ground becoming a laic temple that stands upon the ascension path for souls. Many experts assure that the building commemorates the 6th Centennial of Dante’s revelation. That’s why the building’s definitions are understood in synchrony with Dante’s Divine Comedy. Both –the poem’s and the building’s division is in three; there are nine hell hierarchies, as well as the amount of access vaults representing the initiation steps –there are phrases in Latin above each of them explaining them. The purgatory is divided in seven, as well as Palanti’s tower. The nine divisions of Heaven are represented in the outstanding 300,000 voltaic power bulbs lighthouse, above which it’s the Southern Cross, the entrance to heaven, that can be clearly seen during the first days of June around 7:45 PM, lined up to the Palace’s coordinates. And of course, 100 are the cantos and 100 are the meters the building rises from the ground. Most of the cantos are divided into seven or twenty two stanzas, each floor is divided in seven modules on the front and twenty two office modules and the total height of the building is divided into twenty two floors: fourteen basic stories, seven in the tower, plus the lighthouse. In 1925 Calvo, Jacobs and Gimenez Gimenez together with the Benecich brothers’ construction company brought the Mihanovich Tower into life. An outstanding building of 80 meters above the ground, one of the highest in the country and one of the most important concrete ones in the world back then. Its name’s origin is of course in honor of his owner, Mr. Mihanovich, chairman of one of Argentina’s most important naval companies; he ordered the construction of this fantastic tower, where he’ll had his offices at the top. The building rises from the ground to create the illusion of being a terrene lighthouse, facing the docks of Buenos Aires, the light at the top guides not the ships but the immigrants into the heart of the city. The view of this lighthouse-like tower was, and still is, astonishing, as one witnesses the entrance and departure of ships to and from Buenos Aires. This architectonic masterpiece expresses its greatness through means of a language that emphasizes the combination of classical elements and somewhat French style ornamentation with a terrific art deco finishing touch atop the tower escalated pyramid.The construction was brilliant, but times changed and then Mihanovich moved its offices. The tower remained as Immigrant’s hotel, and then it stood as a once brilliant production then left into the darkness of oblivion. It took over 70 years for someone to recover the tower from forget and deterioration. It was in 2000 when the Accor hotel group bought the building and began to work on its restoration and update to come up with a brilliant hotel that combines the classic restored building with a magnificent top of the top inside, conditioned to provide its visitors with the latest technology and comfort, the famous and gorgeous Sofitel. Nowadays Sofitel Hotel, 841/849 Arroyo St is a luxurious five star carefully restored landmark hotel building dated form 1929 that resembles a lighthouse casting light over the city. The neoclassic splendor of its outside is perfectly blend with a contemporary design and Art Deco interior. The oldest of the buildings in this article is the one created by the French architect Eduard Le Monnier in 1917. This is the central house of the Argentine Yacht Club at the intersection of Costanera Sur Av and Viamonte St. The club was created in 1883 by a group of local enthusiasts of yachting, and a couple of decades latter they moved to Le Monnier’s Art Deco ode to the sea. The French architect designed the club house as a lighthouse building that can be located at Latitude 34° 35' 48" S - Longitude 58° 21' 48" W. Featuring an unquestionable maritime feel, the external lines of this building show an amazing blend between the conceptual mast-lighthouse that is the building’s tower of an unquestionable art deco style. The building evolves from the tower onwards to the South East. The encounter between the sea/nature and the human creation ship/lighthouse that was captivated by the architect is also evident in the construction’s ceiling that emulates the shape of a wave and the sail of a ship, atop a semi circular two story construction facing the North West area of the River Plate. Yet one other wing stretches towards the semi circular levee.Functional and sophisticated this building was a preview into the future of style, lines and design. And as such it has remained a trademark of the Argentine Architecture. Following the River Plate to the point it meets with the Atlantic Ocean is our last architectural beauty: the Punta Medanos lighthouse. Located in a cape side area first discovered by Magellan in 1520, during one of his many explorative expeditions through the Argentinean coast down to Tierra del Fuego, and it was such the impact its beauty had on them that they include outstanding remarks about it on their journals. This is a very special and cherished construction. It was built in France and transported and settled in Argentina between 1892 and 1893. The main body of the building is a cylinder. One can access the light room walking up the 298 steps. The lighthouse is located 36°53’ south 56°40’48’’ W, six miles north from Punta Medanos and 500 meters from the high tide line. This is just an incredible example of a beautiful lighthouse in one astonishing scenario of beauty. In spite of the fact that the architect remains unknown, this building stands for the beginning of a durable relationship between Europe and Argentina in terms of style, sophistication and aesthetic approach to life. Two are the features shared by these buildings and constructions, one being the European strong aesthetic influence that we’ve stated previously; and the other, being the marriage between the Architecture and the Sea. The fact that all these buildings have been conceived as architectural lighthouses and a plus, is what has brought them together in this conceptual project. We have began to work on the research of their history and stories a while ago and since then have found a number of amazing stories to tell. That’s how we’ve come to begin to develop our documentary on Art and Light. The first part is fully dedicated to these lighthouse buildings, their significance and their cultural importance. Such has been the impact these stories have had on us that we’ve began to share the preview and production process with some collector friends deeply attached to the social and cultural value of lighthouses. The result has been not only a tremendous input into developing this documentary –which we’ll be sharing with you all in short term- but also to create a unique lighthouse tour guided by the initial concept of ART AND LIGHT.